Spiderette Solitaire.net brings you the best of your little lady spider friend to a fun, exciting solitaire card game with three games to choose from! Don't shuffle through other sites trying to find this great game... we've got only spiderette solitaire card games, 100% free, 100% of the time! Similar to her big brother Spider Solitaire, the goal of Spiderette Solitaire is to create four stacks of cards created in descending order according to suit. Only stacks with the same suit may be moved. Spiderette plays with only one deck, instead of two. Stuck? 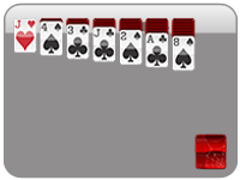 Click on the stock which will deal additional cards onto the playing field. Miss Spiderette bites a bit harder than her brother, so take the challenge and see if you can truly master the queen spiderette. Share on facebook to challenge your friends to beat your high score!